On May 27 at about 9:30 a.m., the Arcata Police Department received a report that an unknown male subject had telephoned a suicide hotline from within the Mad River Community Hospital building. The male subject told the suicide hotline staff that he was armed with a gun and was going to kill himself or someone else. 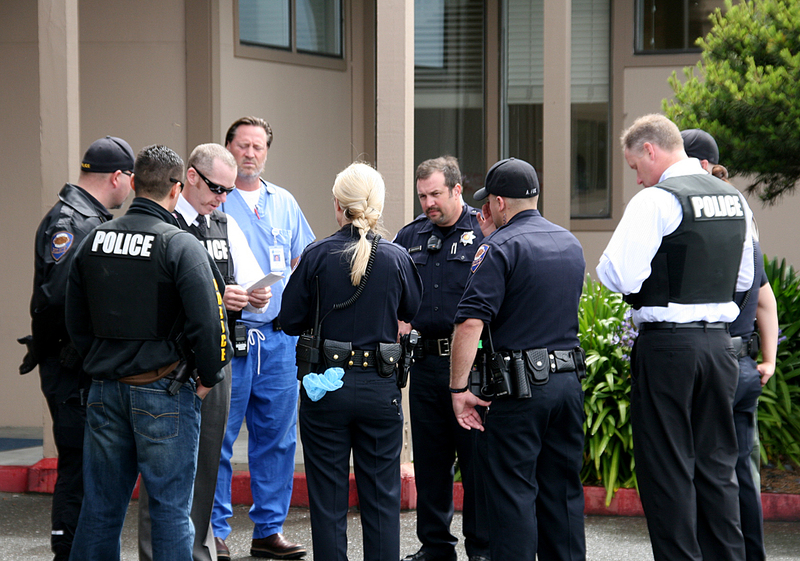 Officers from the Arcata Police Department immediately responded to the hospital, where they met with MRCH staff who had further information including a possible subject description. The hospital had conducted a lockdown of their facility. The Arcata Police Department contacted both Pacific Union School and the United Indian Health Services Potawot Health Village, both in close proximity to the hospital. Each facility conducted a lockdown as well. With the assistance of the hospital staff, a room by room search was conducted of the entire hospital property. The Humboldt County Sheriff’s Department assisted. After an extensive search, the subject was not located and the hospital lockdown was cancelled. The lockdowns at Pacific Union School and the United Indian Health Services were also cancelled. While the search was conducted at the hospital, Arcata Police Department detectives developed additional leads as to the identity and whereabouts of the subject. The subject was located in McKinleyville. The subject matched the description provided by the hospital and he admitted to making the threatening statements. The subject was evaluated and determined to be a danger to himself and others. He was detained on a Welfare and Institutes Code 5150 hold (mental health evaluation) and subsequently transported to Semper Virens in Eureka. A hoax seems to be the reason for a lockdown today at Mad River Community Hospital (MRCH) and subsequent search by the Arcata Police Department (APD) and the Humboldt County Sheriff’s Office (HCSO). A phone call was made early this morning from a courtesy phone at the hospital to a suicide prevention hotline that in turn alerted the hospital switchboard operator to the possibility of an individual in the hospital who was considering suicide. The hospital immediately followed its protocol to lock down the patient care areas and to contact the APD and the HCSO who responded within a few minutes and immediately conducted a search of the hospital buildings and its grounds. Patients and staff were kept from harm’s way at all times. APD eventually located and detained the subject who made the phone call from the hospital. As a standard procedure the Pacific Union School which is adjacent to the hospital was notified that a lockdown was in process. This entry was posted on Thursday, May 27th, 2010 at 2:33 pm	and is filed under News. You can follow any responses to this entry through the RSS 2.0 feed.